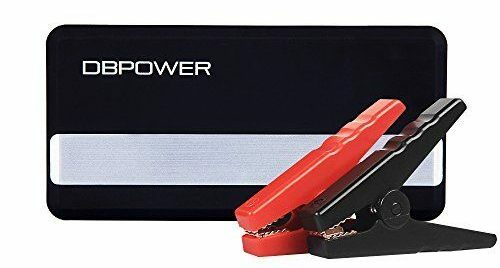 This DBPower car jump starter comes complete with heavy duty clamps and cables and can jumpstart vehicles up to 15 times. This device also features dual USB charging ports so can also be used for smartphones, tablets and other mobile devices. The unit can be fully charged in just hours using the included mains adaptor or you can use the provided in car charger to recharge the unit whilst driving! With this DBPower unit you can make sure you and your loved ones will never be stranded. This unit has an LED light with strobe and SOS feature which could be an emergency life saver. The unit is compact and fits into the included semi-hard case with a zipper and wrist carry strap. For complete peace of mind, DBPower also offer a 3 year warranty and class leading customer support. The 12v portable car jump starter and air compressor from Fifth Gear can jumpstart any vehicle, plus the 260 PSI air compressor comes in handy to inflate car tyres and all kinds of inflatables. The built-in emergency lights could be very useful too! This device can power supply many appliances that require cigarette lighter socket connections and it is compact enough to easily be carried in your boot for emergencies. This tool is really 4 devices in one: a 12V Jump Starter; a 260 PSI Air Compressor: An Emergency Torch; plus a 12V Power Socket to power a variety of other devices. The unit comes with 400amps extra long starting cables for easy connection and is rechargeable through a 3 pin mains plug or via the 12V cigarette lighter plug (both of which are included in the pack). This compact jump-starter is another top quality product which can start petrol engined vehicles up to 2.5litres with a peak current of up to 300A. The unit can also be used as a portable battery charger and has a 8000mAh capacity for charging smartphones, tablets, and other mobile devices with a 2.1A output for rapid charging. This device meets all current safety requirements and includes overload protection, over current protection, over-charge protection and short circuit protection. In the pack you get the jump starter DJS40 model, heavy duty jumpstart cables and android USB cable, along with a welcome guide and full instructions.